The Summer 2016 newsletter is all about research. It includes a feature on two of the recipients of the 2015 Macular Disease Foundation Australia Research Grants and the Foundation’s annual research update. It also includes the winners of the Foundation's mEYE World Photographic Competition, and an update on subsidies available for low vision aids and technologies. 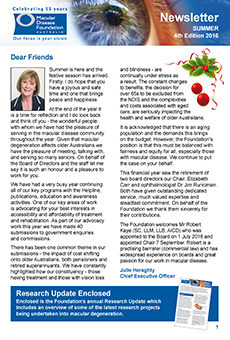 To find out more: Macular Degeneration Summer 2016 newsletter. Read the Foundation's Research Update 2016.